Deep into the Moment of the Stitch. Economics allowed the Baroque artist to shift importance from the court and church to the mundane. 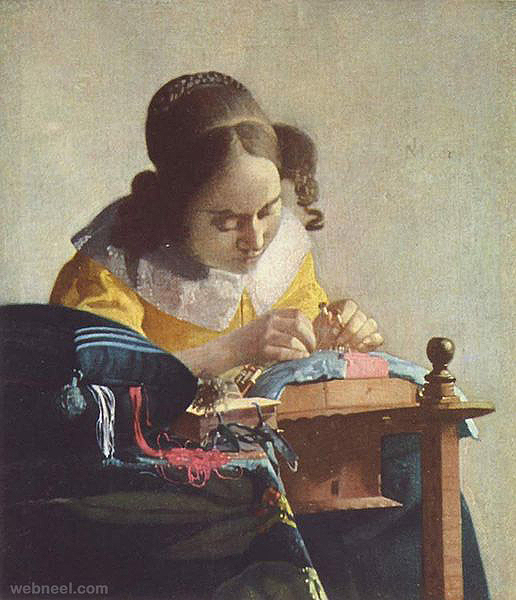 Vermeer’s paintings captured segments in time and space of everyday life; a kitchen maid pouring milk, a lady writing a letter, a lady reading a letter, a woman making lace, individuals who have transcended their surroundings, their agenda, their yesterdays, their tomorrows. They are deep in the moment of the stitch. Pulling the needle away from the cloth, pushing the needle into the cloth. Again and again. The rhythm of the movement. The dance between the cloth and the needle worker. Turning the fabric. Holding it up to appraise progress. 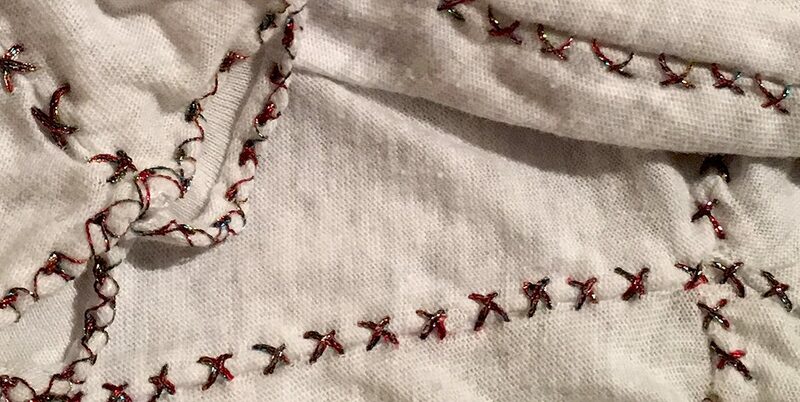 STAND UP if you have created a stitch in a simple piece of fabric, repairing it, embellishing it, securing it, or resizing it. Surgery performed by the commoner. Next time you are making your mark in your ordinary world, waxing your car, ironing, sweeping, cleaning, stop and observe yourself, Be with your breath. Be with your moment. Capture it in your mental camera. Know that your collective everyday activities offer seeds for another. Allow boredom, depression or negativity to fall away as you continue your dance deep into the moment of your stitch.